Nagarjuna (Tib. ludrup: klu sgrub) is the name given to the great early Indian scholar and founder of the Madhyamaka or ‘Middle Way’ philosophical school of early Mahayana Buddhism. Regarded as the ‘Second Buddha’, who along with Asanga is recognized as one of the two Supreme Ones and Six Ornaments of Indian Mahayana Buddhism. Although little is known about Arya Nagarjuna (c.150-250 AD) as the early India philosopher, he is believed to have been born in South India, and his most famous works were the Mulamadhyamkarika or ‘Fundamental Verses on the Middle Way’, and the Prajnaparamita or ‘Perfection of Wisdom’ sutras, which according to legend had originally been entrusted to the naga-serpents by Shakyamuni Buddha to be later retrieved from the bottom of the ocean by Nagarjuna. Because of this legend Nagarjuna is traditionally portrayed as a Buddhist monk seated upon a lotus or throne with his two hands making the dharmachakra mudra, or teaching gesture of ‘turning the wheel of dharma’ in front of his heart, with a canopy of seven naga-serpents crowning his head. This iconic image is similarly applied to some of the later emanations of Nagarjuna, especially the ninth century mahasiddha or ‘Second Nagarjuna’, who, as a disciple of Saraha, was a master of the Guhyasamaja Tantra, and a teacher of the mahasiddhas Aryadeva and Nagabodhi. Another siddha bearing the name of Nagarjuna was a practitioner of rasayana or alchemy, who was reputed to have lived for six-hundred years, and thus the legendary lives of several different siddhas named Nagarjuna are often collated. However, the early historical Mahayana Buddhist site known as Nagarjunakonda in the South Indian State of Andhra Pradesh, and known in ancient times (c. 225-235 AD) as Sri Parvata, was definitely named after the first Arya Nagarjuna. In this painting Nagarjuna is shown with a topknot, wearing the three red robes of a Buddhist monk, and with an entwined canopy of seven snakes or naga-serpents arising above his head. 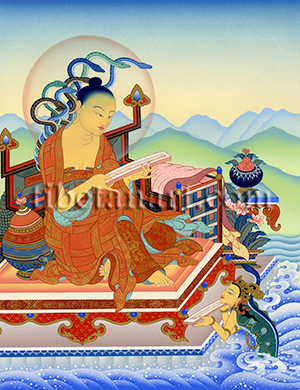 He sits enthroned above the waters of a lake with a naga-serpent presenting the text of the Prajnaparamita-sutra to him, while Nagarjuna receives the same text with both his hands. A round scriptural basket containing the teachings of the tripitaka or ‘three baskets’ on ethics, meditation, and discriminating awareness is behind Nagarjuna’s back, while the many great scriptural texts composed by Nagarjuna are stacked behind his throne.